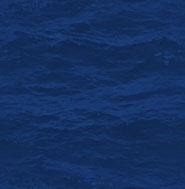 GLAD THEY WERE A SALTY GROUP! 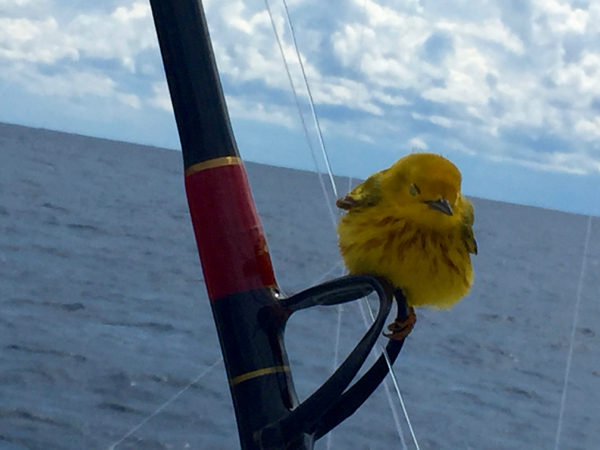 Wind was blowing 20-25 when we headed offshore, and 25-31 when we headed home early as seas got a bit gnarly!! 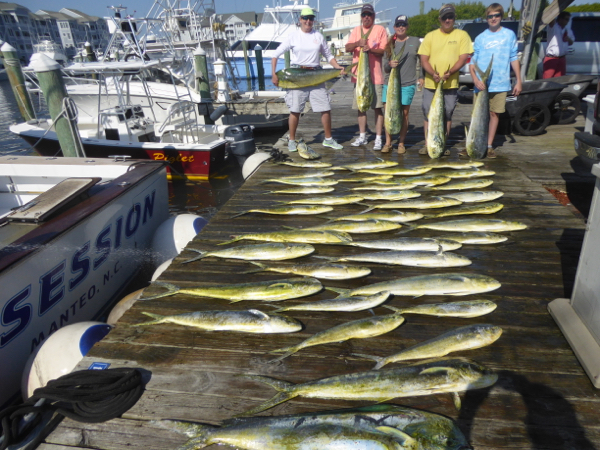 But long time customers Billy & Brian Pittman and son Randy never missed a beat.... they boated a nice catch of 5 -17# mahi to start the day and then four yellowfins in the 40-50# class. 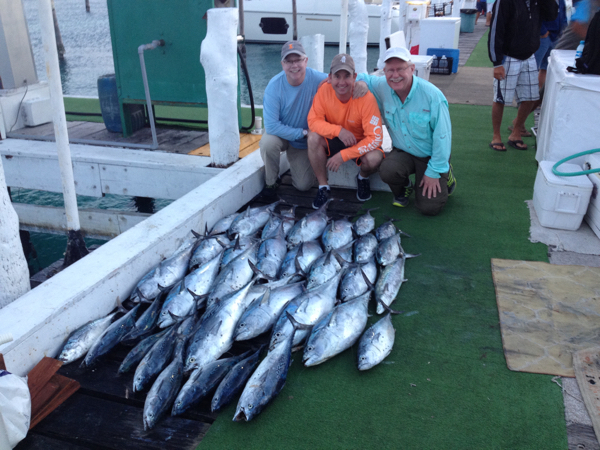 TUNA TUNA AND MORE TUNA!! 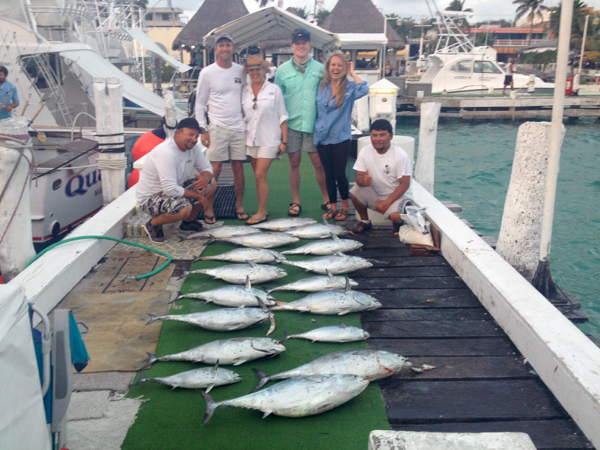 Paul Winter & Becky Hucks, who fish with me in Mexico, along with friends filled the box and then the ice chest with 40-50# yellowfin and we headed in around noon with fish laying on the deck....when they hit us it was in 3's and 4's and 5's & 6's! ACTION THE LAST DAY OF BIG ROCK BUT NO MONEY FOR US! 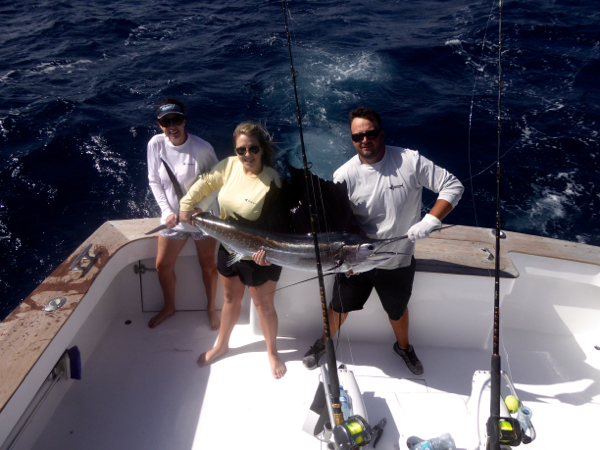 With several big fish on the leader board we needed a lunker the last day but that did not happen. 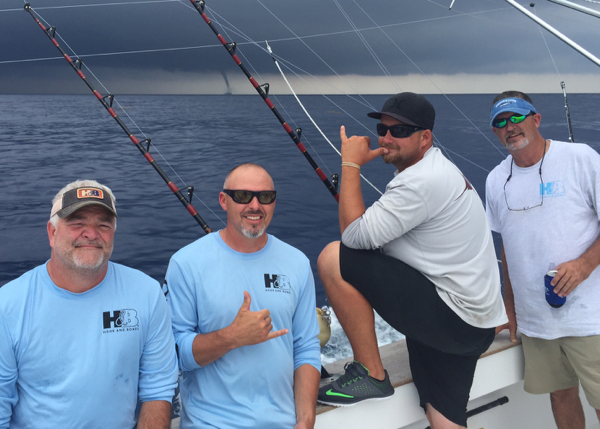 We did have pretty good action but did not come up with much.... Raised a small blue marlin that went teaser to teaser and then went on a pitch bait, but all we got back was the hook and never bent the rod! 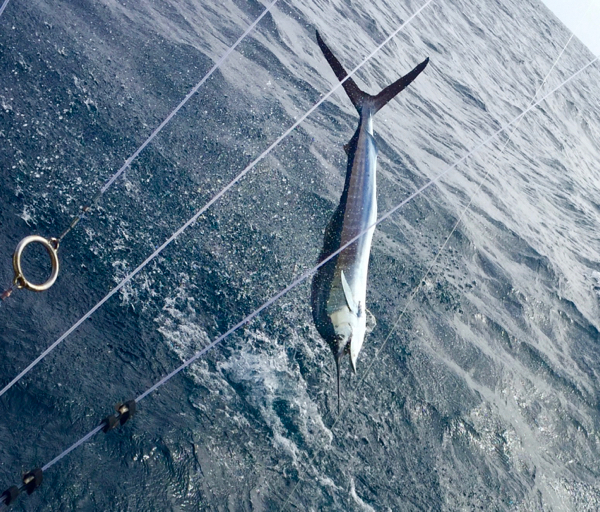 Not long after we raised a white marlin and John Moore, from Swansboro, NC caught that.... his second white of the tournament as he released on our first day..... in early afternoon we raised another blue marlin just as we were going thru a grass line and lost sight of it in our turn.... damm if the boat right next to us hooked a small fish right in our spot a few minutes later...... than late in the day we tried to bait a couple of tailing white marlin, one turned on a teaser, but neither showed much interest in oiur spread. 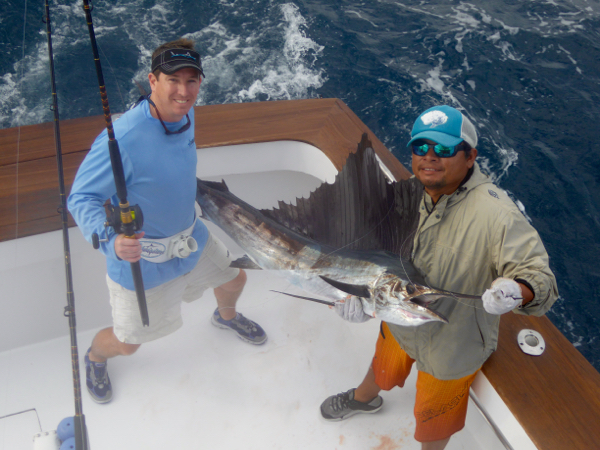 Earlier in the week, Britton Benedict, from Southlake Texas released his first Atlantic sailfish. 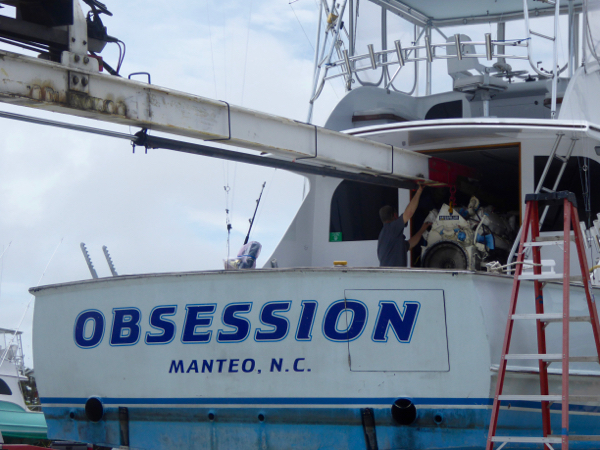 We had a great time fishing with what was a new crew for the Obsession, including John Moore & John Gainey from Swansboro, Mike Springfield from Cape Carteret, Steve Boswell from Colleyville, TX, Britton Benedict from Southlake Texas, & RD Benedict from Swansboro. 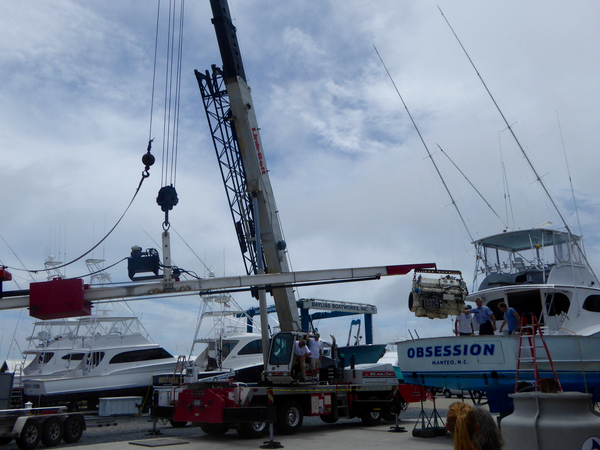 Hopefully things work out and we will get to fish the Big Rock Tournament with them again next year. This is always a great tournament, well run, good action and great camraderie! 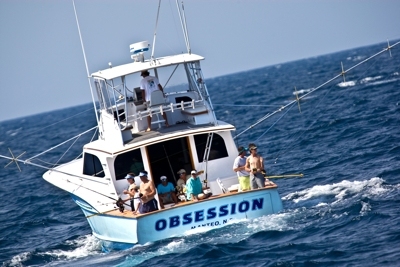 We finally got the Obsession going again just in time for the Big Rock Blue Marlin Tournament. 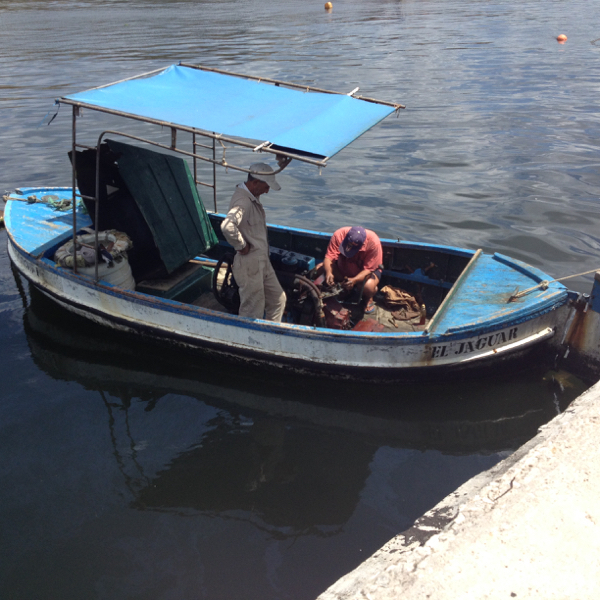 We have fished three days and are laying today with one day to go.... Need a big fish tomorrow!! 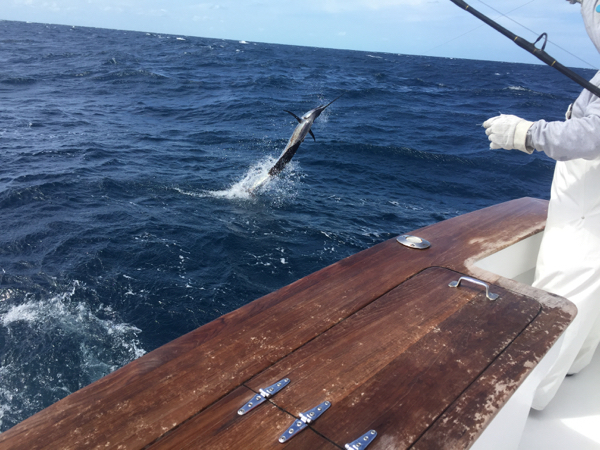 Lost a blue marlin and caught a white marlin on Monday, caught a sailfish on Tuesday, but saw nothing yesterday as condtions were not good..... Maybe tomorrow!! SOME DAYS NOTHING GOES RIGHT!! 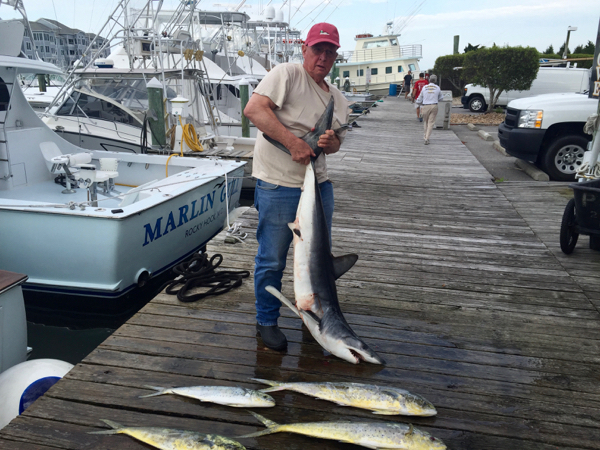 Last Thursday, Tony Journigan, from Tidewater VA fished with me for the first time in a number of years..... 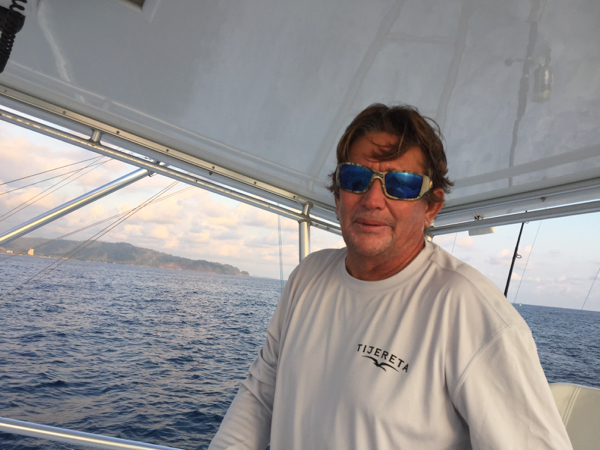 I always enjoyed fishing with him and his crew and was looking forward to putting him on some good gaffer dolphin fishing like we had been experiencing....anyway, headed a bit south of where there had been some tuna action the day before, in hopes of finding some conditions and getting a catch of mahi, and then working north towards the tunas..... unfortunately, no sharp change and just a slow dolphin pick, so we finally ran up north..... caught a handful of nice yellowfin but hard luck again & again, hooked a nice blue marlin but the line broke, late in the day we pulled the hook on a nice tuna right at the boat, and then hooked another to end the day and damm if a shark didn't eat that one! AND to end a perfect day, as we were running home at an easy cruise, my 3412 CAT, which I had a routine (and ahead of schedule) valve job lined up to be done this past weekend, DROPPED A VALVE!!! and tore up a piston!!! 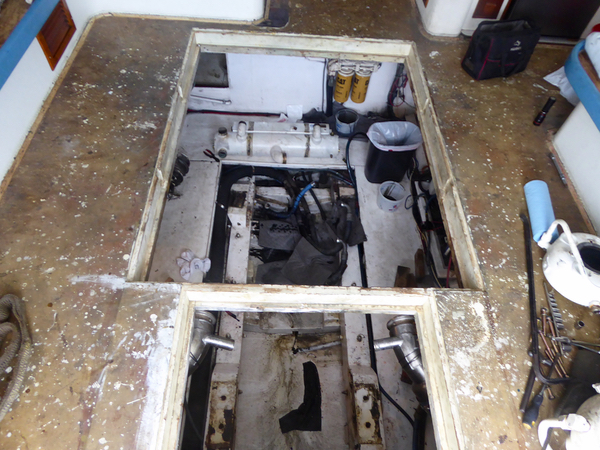 So after a few miserable days of diagonsing the problem, lining up help, thanks to Rick Moore and John Bayliss's yard crew, I have the motor ready to be removed from the boat tomorrow morning for a total rebuild..... no sense in just replacing one cylinder with 12,000+ hours on it..... 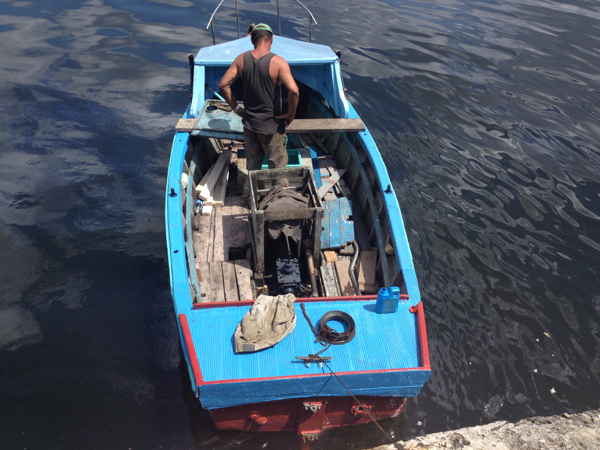 SO, I have been putting my scheduled groups on other available boats, and hope to be going again by very early next week......If you are reading this Ken Henry & company, I am hoping to take you fishing next week baring any more disasters! And we will be in Morehead for the Big Rock the following weekend come hell or high water!!! 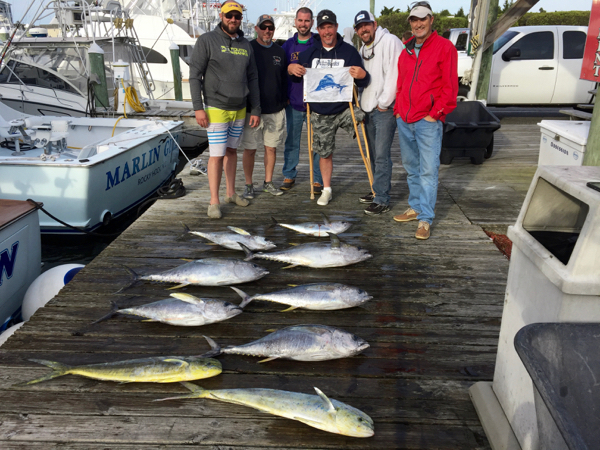 Shani Diggs, from Ohio, Robert Crowder & Charley Townes from Virginia, and Chandy & Kyler from Virginia sent us home early as the box was full and they were wore out from nonstop action on gaffers, many 15-28# class fish, all on standup light tackle! 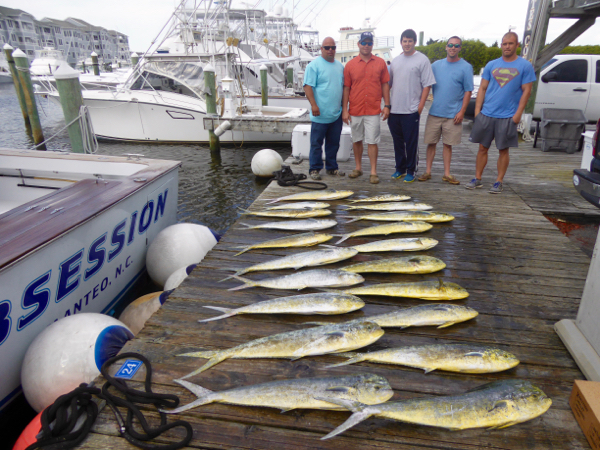 And the dolphin fishing was great.....Shani Diggs, from Ohio, Robert Crowder & Charley Townes from Virginia, and Chandy & Kyler had great standup light tackle action on 5 - 25# dolphin, in the first of their four days of fishing this week.... don't know what we are going to do for an encore!! 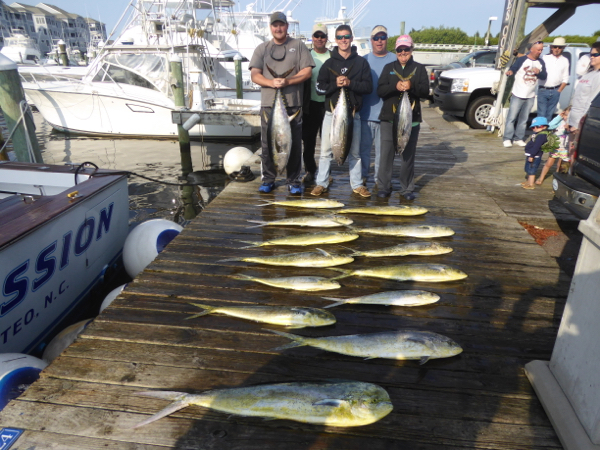 ROBERT ANDERSON & CREW FROM VIRGINIA FISHED YESTERDAY IN ROUGH CONDTIONS BUT BOATED A GREAT CATCH!! 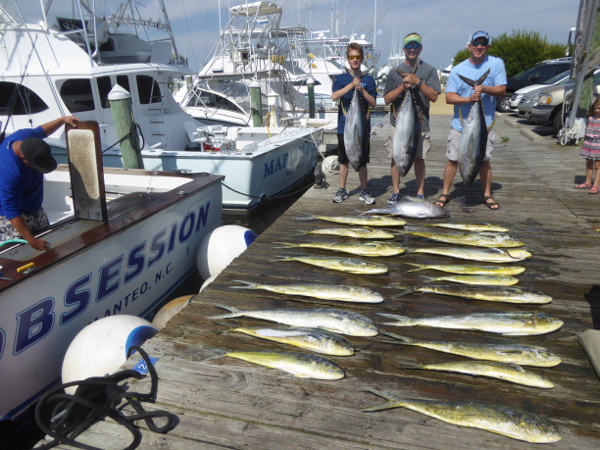 Rob & crew fished with me the last 4 years..... did a great job catching a bunch of dolphin in the morning from 7 -19# and then boated tuna in the afternoon ranging from 30-56#. AND THEY BRING THE BEST PHILY HOGIES ! 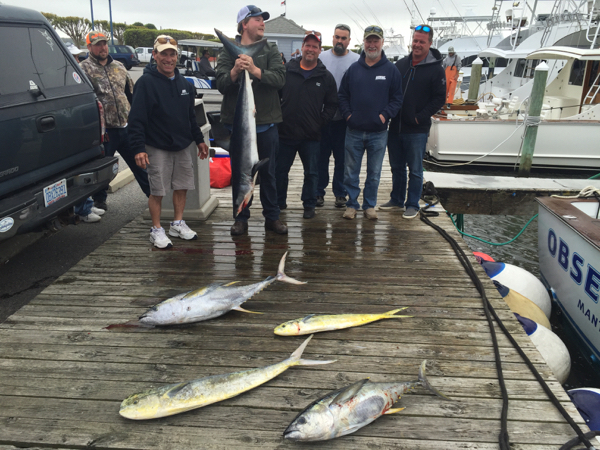 STEVE COOK AND CREW, FROM NEW JERSEY, AND THEIR CATCH FROM MAY 14.....A GREAT GROUP OF GUYS TO CELEBRATE MY BIRTH DAY WITH!! 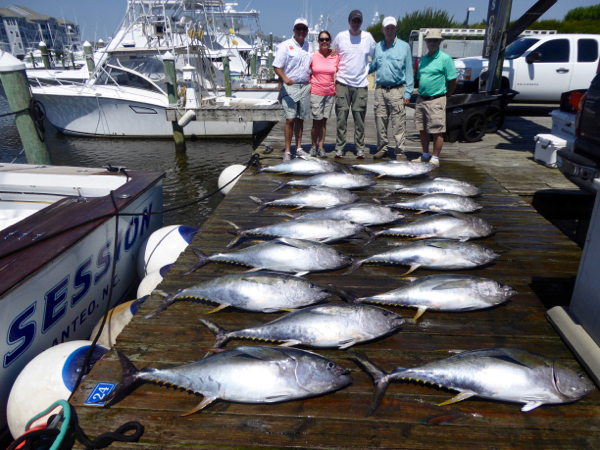 GAFFERS FROM 8 - 20# AND A SINGLE YELLOWFIN TUNA FOR ASSOCIATES OF CORY THORNE. GLAD THESE FOLKS ARE TOUGH!! Richard Lee and company from around Roanoke have fished with me for 15 years and they have been out on some rather 'sporty' days, so when I gave them the option yesterday they looked at me like I was crazy.... anyway off we went.....Rough a s#^$ in the morning, nearly rolled over a couple of times, but things mellowed out, then calmed down nicely in the afternoon.... kinda challenging fishing in the hot water with a 25 knot northeaster in the morning but we picked out a few nice gaffers up to 25#, and then went tuna fishing in the afternoon and caught a single then 2 out of 3 bites with fish ranging from 20 -45#. 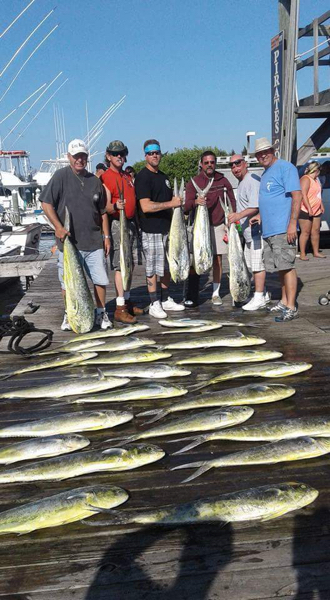 John Niejadlik & crew from New Jersey, who fished with us yesterday, had another exciting day of big gaffer dolphin fishing, with 'wolfpacks' of them attacking us several times, and the guys did great boating 5 or 6 at a clip....pure cockpit chaos....the fish ranged from 7 - 24#. 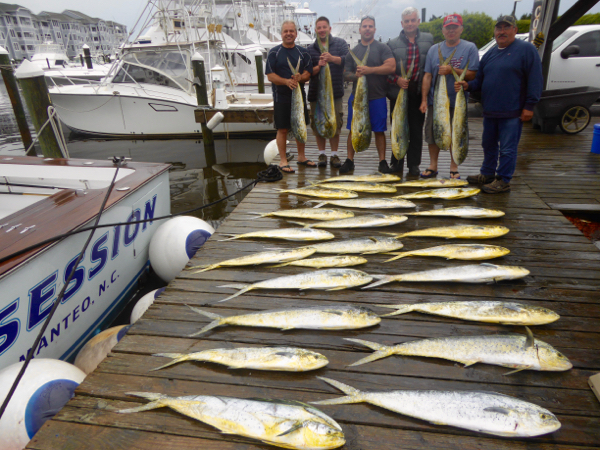 JOHN NEIJADLIK & CREW FROM NEW JERSEY, , HAVE FISHED WITH ME FOR THREE YEARS NOW, AND TODAY BOATED A NICE CATCH OF GAFFER DOLPHIN 7 - 18 LBS. AT ONE TIME THEY HAD 8 ON AND GOT THEM ALL....COCKPIT CHOAS!! TOO BAD THIS DON'T LAST LONGER! 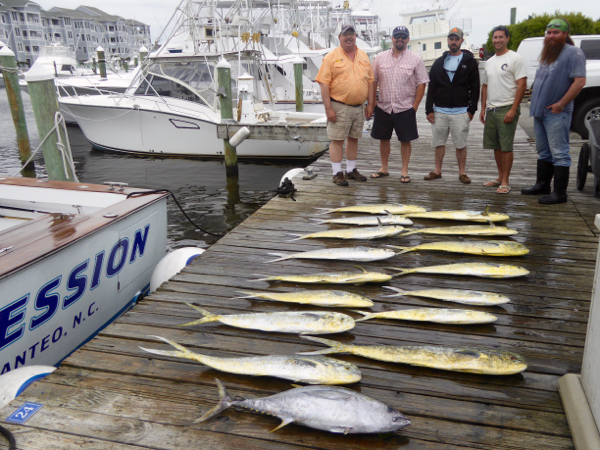 The main run of big dolphin migrating north into North Carolina waters unfortunately only lasts a few weeks, but it sure is fun while it lasts.....Jay Boone & crew, from southern North Carolina, are all good anglers and that helped yesterday as the gaffers were charging in there in wolfpacks..... We figured around 12:30 we had enough and were getting ready to go home when all the rods bowed over again & I don't know how many other dolphin were behind us chasing our teasers and hooked fish around but they guys kept pitching baits in the water & watching gaffers fighting to get to the baits and when it was all said & done there was dolphin banging all around the deck and jumping out of the fish box. 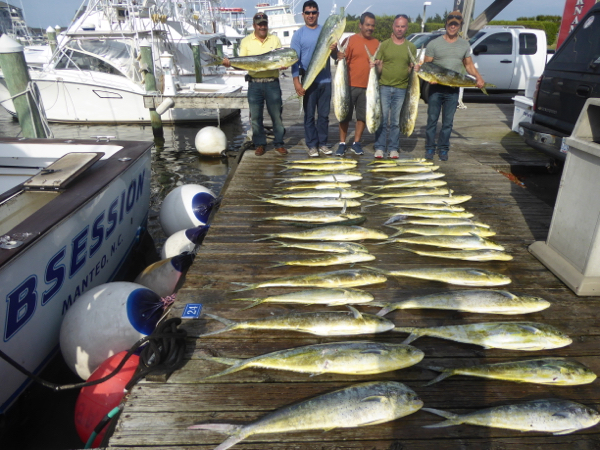 FREE RANGE DOLPHIN FISHING AT ITS BEST! Gary & Jerry Coffman, from California and Virginia, celebrating their 53 wedding anniversary, and i who have had some great fishing with us in years past, split a trip with regular makeup trip customer Ben McCracken & his daughter Jeslyn & husband Buddy, from South Carolina. 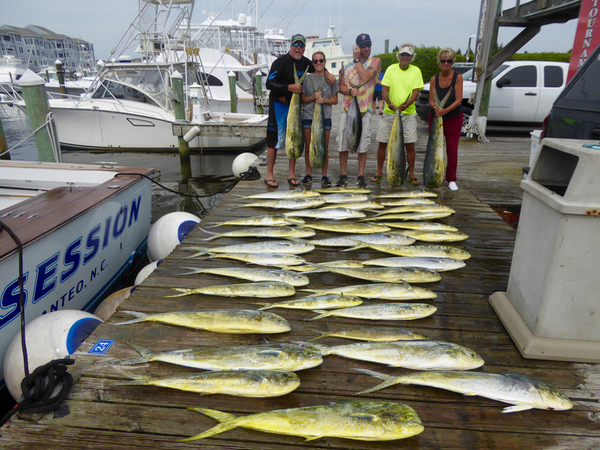 They had non stop gaffer dolphin action, most on standup light tackle, with several fish up to 25#.... action was so fast an furious at sometimes, that at one point we had 8 fish on and several more following us. TOUGH START BUT WE PULLED IT OUT! We headed offshore this morning, and based on my morning satalite water temperture shot headed for what should have been a sharp temperture change.....the fleet spread out, but as my luck would have it, I landed in the section where the change was not sharp, non existent, and blended out....most boats landed on some type of change they could follow and started catching dolphin.... but not us! Rather than running to where others were, we trolled around and finally found some good conditions and, inspite of the incessant attacks by the ubiquitous bonitos (alias boneheads, false albacore, Euthynnus alliterates) that must of followed us north from Mexico (never seen them this abandant or such a nuisance in North Carolina), Ben Messer & crew from North Carolina had good action boating an nice catch of 5 -20 # dolphin on light standup tackle! 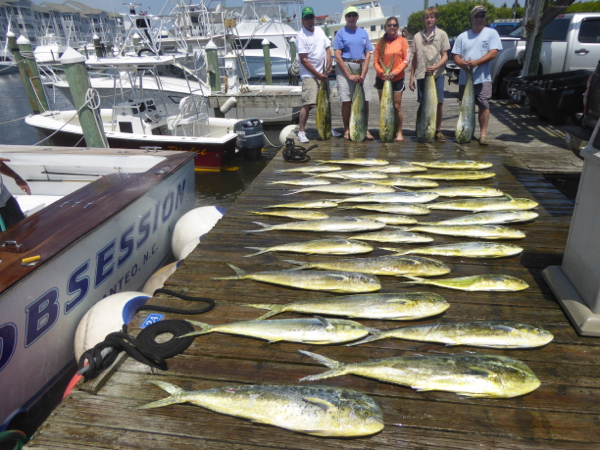 BOB FOREHAND & CREW FROM TIDEWATER VIRGINIA BOATED A FEW NICE DOLPHIN UP TO 20# ON A DAY OF SLOW FISHING! Cory Thone & cohorts Mary & Dan were not blessed with the best of weather....fog delayed our departure and then stuck with us all day..... had trouble following the change cause i could barely see it.....forecast was for 10-15 NE but around midmorning it was blowing a solid 20NE and gusty....seas picked up to a steep 7 ft.....no one had much action as the change was poorly defined but we had one awesome flurry of nice size gaffers and the crew boated 10 in one volley, but then never had another bite.....by noon seas were uncomfortable, the limited action had ended and everyone headed home in great need of at least 3 full fingers on the rocks!! 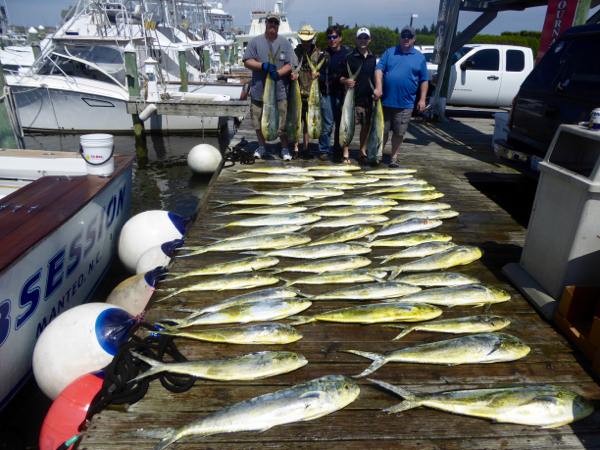 KEVIN OBRIEN & CREW, FROM VIRGINIA, HAVE FISHED WITH ME FOR SEVERAL YEARS, BUT NEVER HAD DOLPHIN ACTION LIKE TODAY. 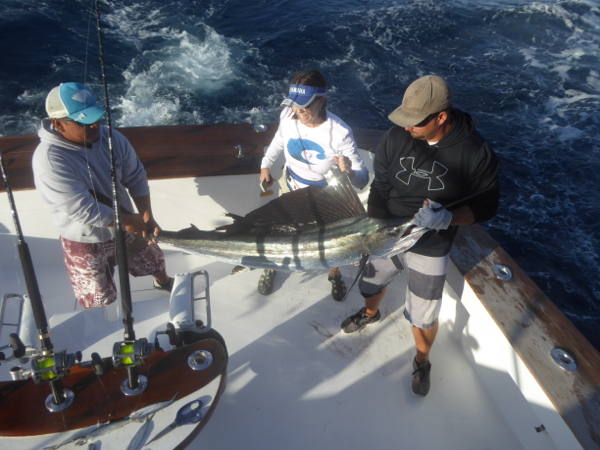 STEADY ACTION ON LIGHT TACKLE, WITH MOST FISH 5 -20 LBS. 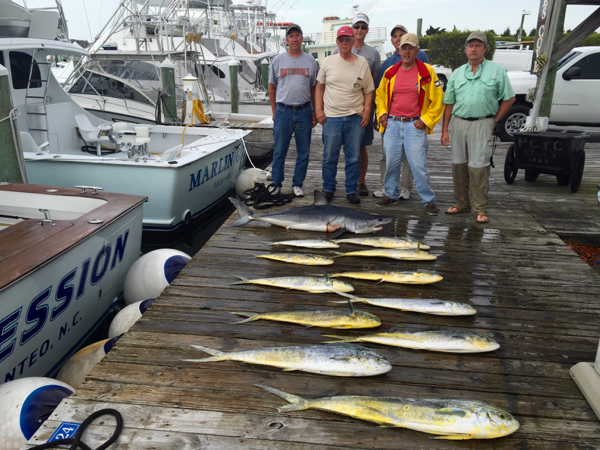 BIG DOLPHIN MAKE SEASONS BEST SHOWING! 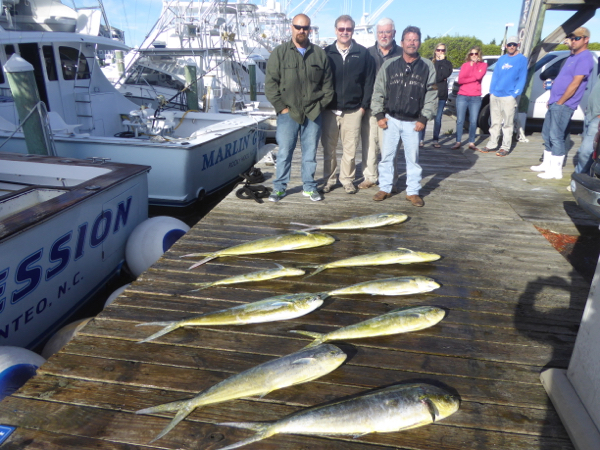 Israel Lau and crew from Connecticut & New York, have fished with me for three or four years now, and always have good luck..... yesterday they had action all day long, and boated a nice catch of 5-18# dolphin, many on light standup tackle. 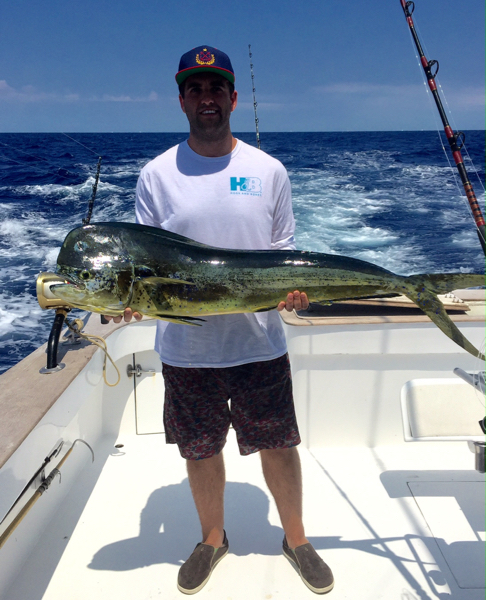 LOTS OF ACTION FOR ANTHONY GOMES AND HIS CREW FROM NORTHERN VIRGINIA TODAY! 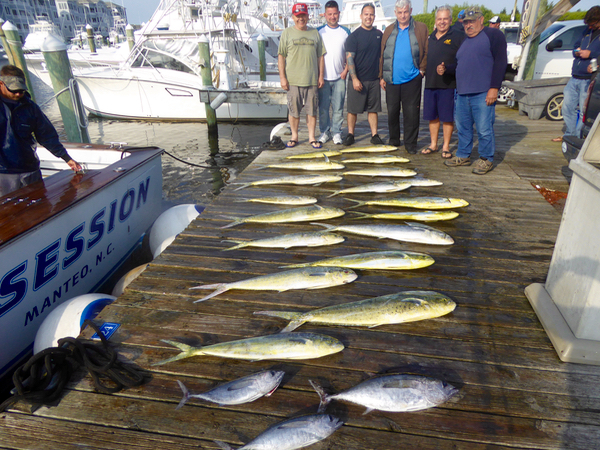 TOUGH FISHING BUT SOME GOOD EATING! 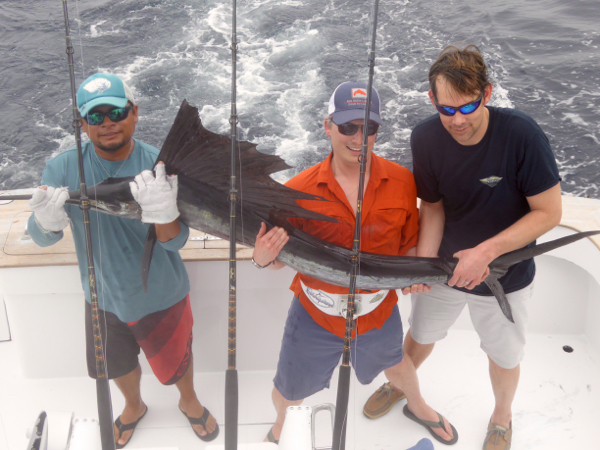 For the second day in a row a 15-20 knot cold northeaster had the gulf stream an uncomfortable spot to fish, but inspite of slow fishing Charlie Lillis & crew, from Connecticut, scrapped out a good eating catch of fish their second day of fishing, with the highlight Aaron Louie's boating a 70 lb mako shark. 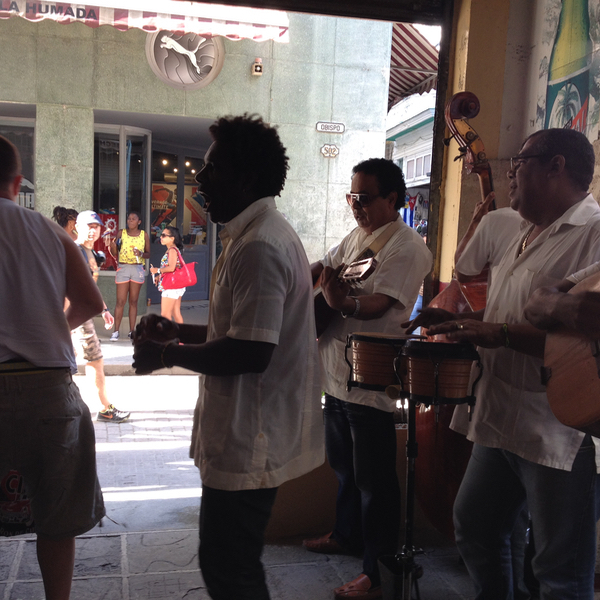 I WISH I WAS STILL IN MEXICO! Cold today, rough NE 20, foggy, change hard to follow, cold water crossing the good bottom, and not a lot of fish around, and COLD!.... 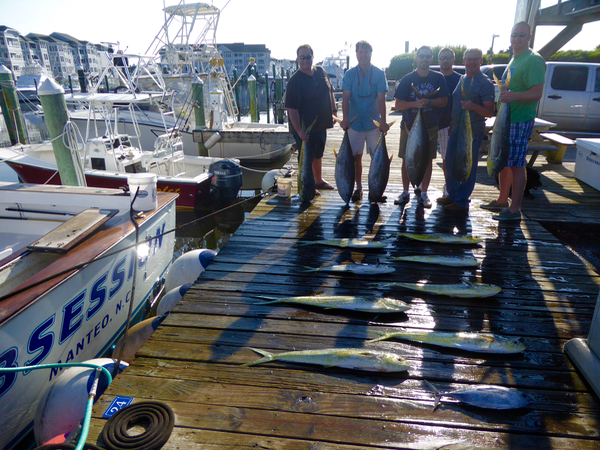 tomorrow I am wearing my lined jeans and UGGS..... but Charley Lillis & crew from Connecticut, who have fished with me for 8 years or so, had a good time boating a nice catch of fish for today! 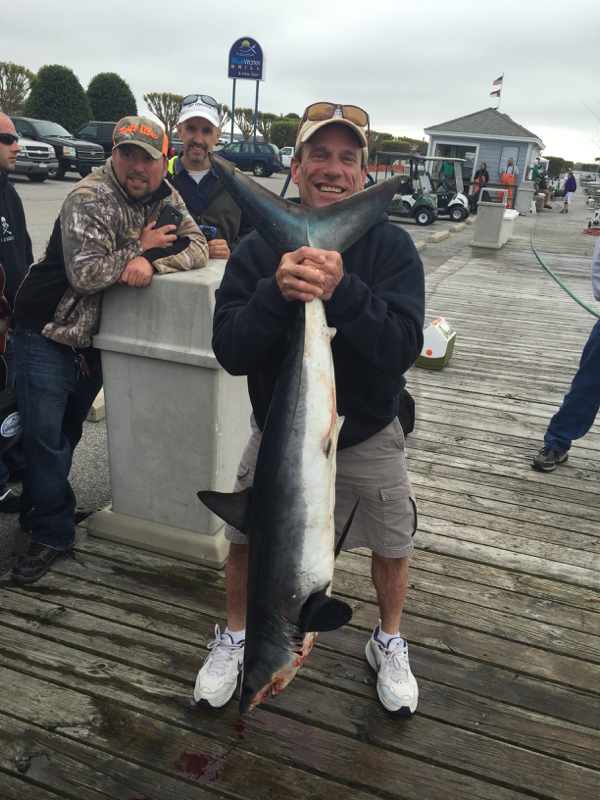 PAUL EBERT BOATED A 77# MAKO SHARK! 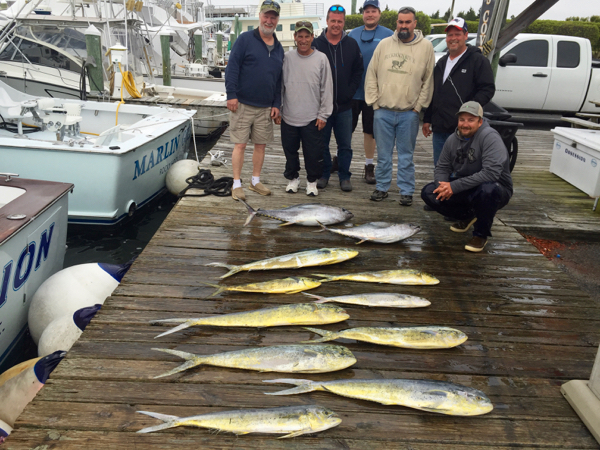 Paul and Pete Ebert, Chuck Rector, Joel, Phil & Blair have fished with me a long time and it was great to have them aboard again... 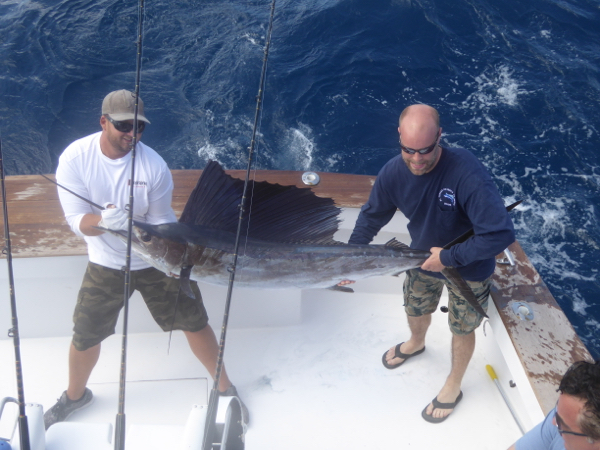 Unfortunately, after very good fishing for both mahi and tuna yesterday, water turned cold as the gulf stream pulled offshore..... no tunas to speak of and scrappy mahi fishing, but the guys had a good time, we all ate well and Paul did a great job boating a nice mako and we had a sailfish on and jiumping but it threw the hook. 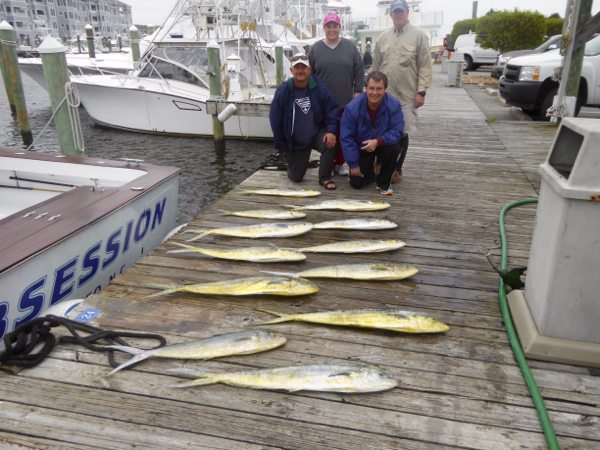 I AM BOOKED MOST EVERY DAY OF MAY, BUT DO NEED A FEW MORE ANGLERS TO FILL UP A GROUP ON WEDNESDAY MAY 11. 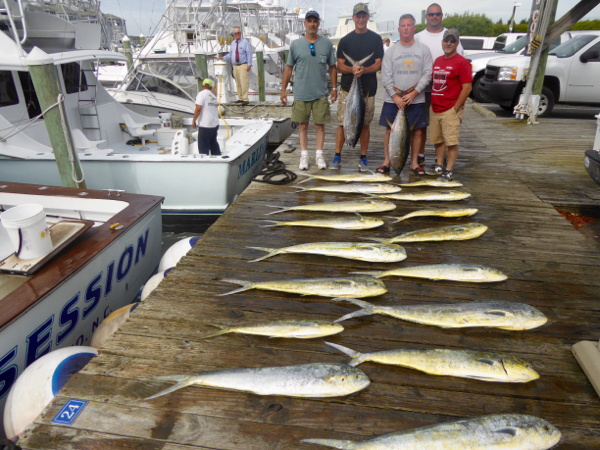 Seas were calm, other then an adventurous passage through Oregon Inlet, and a lot of boats out today that could not get out yesterday.....fish were there, but not biting but John Moore, John Benedict & crew boated a good for today catch of 20 -30 lb yellowfin tuna and a few nice gaffer dolphin.... Ronald "RD" Benedict caught his first billfish ever, a sailfish to earn a citation. CANCELLATIONS DELAY OUR SEASONS START..... NEED SOME FOLKS FOR TWO MAKEUP GROUPS IN NEXT FEW WEEKS!! 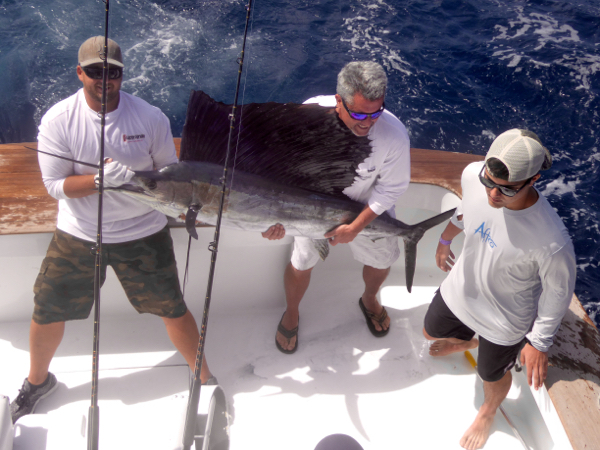 Had a few trips scheduled recently but bad weather and other factors caused cancellations. 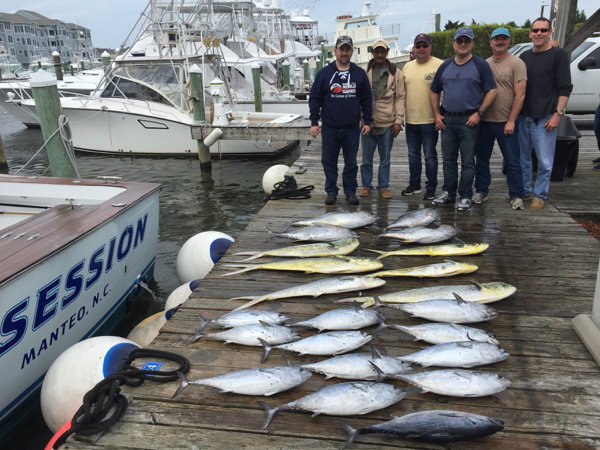 Yesterday was the first day a few boats went fishing in two weeks and yellowfin fishing was great. 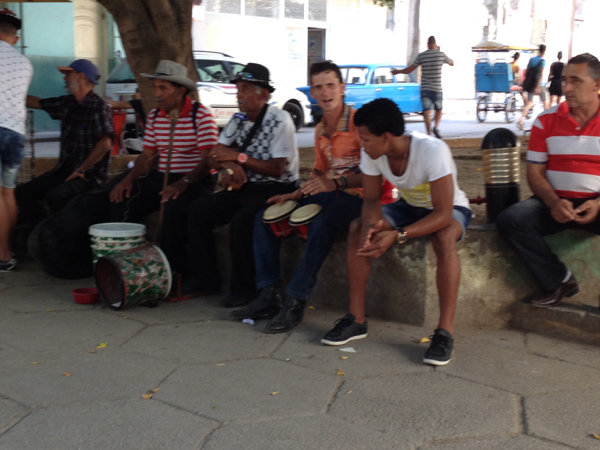 We have several trips next week, and will be very busy after that. I also have two guy looking to join 2 or 3 more on either of my two open days the 2nd week of May, either Mon May 9 or Wed May 11. 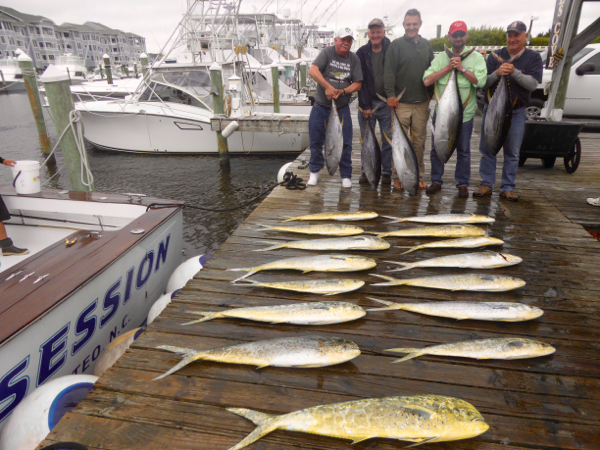 Call 252 480 0094 or email (captjeff@mindspring.com) me for more details on these trips..... fishing should be very good for tuna and dolphin. 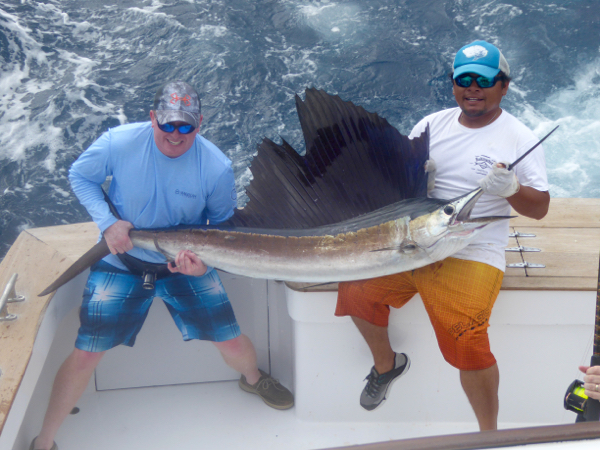 I recently spend a week in Costa Rica and had the pleasure of riding along with legendary Captain Bubba Carter. 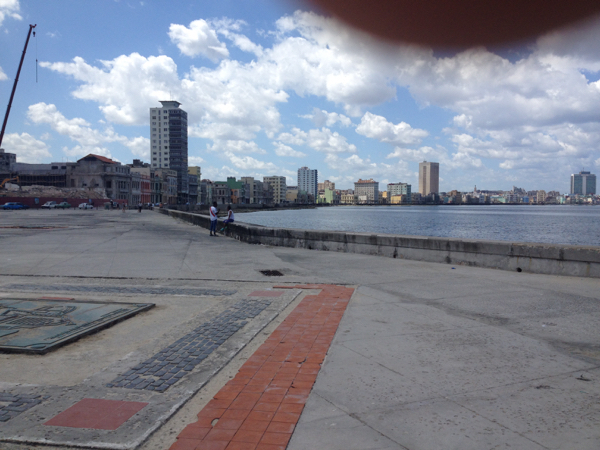 After years of talking about it, I finally got to Cuba. 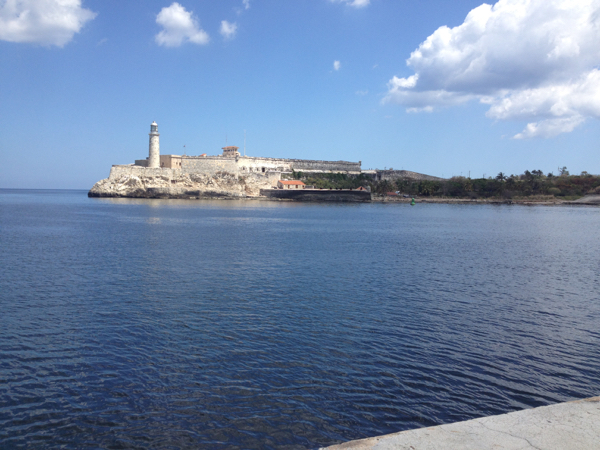 Wanted to bring the OBSESSION into Havana on the way home, but with no insurance for Cuban waters, and no partner boat for backup, Joe and I decided it was best to just fly in, scout things out and plan for next year. 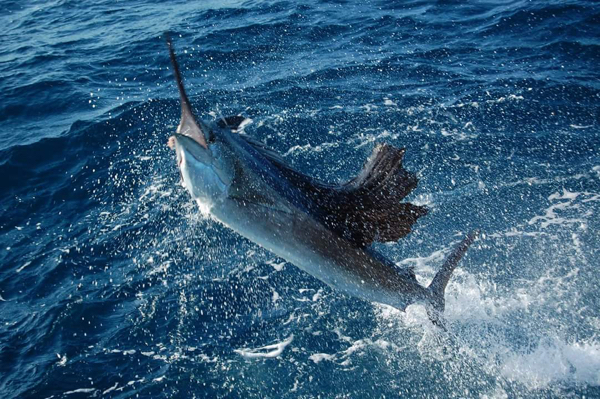 I have been in contact with a company that would provide us insurance next year, so after the Isla Mujeres sailfish season, if all goes well, and possibly teaming up with Anthony, I will be running a trip or two from Mexico to Cabo San Antonio, Cuba, and back , where reports of blue marlin, wahoo and virgin grouper waters the very western and remote end of Cuba. 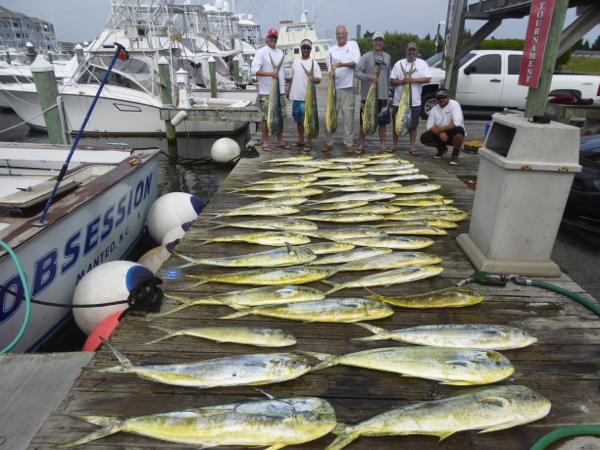 Then a couple of weeks based in Hemingway Marina for the adventurous fisherman! 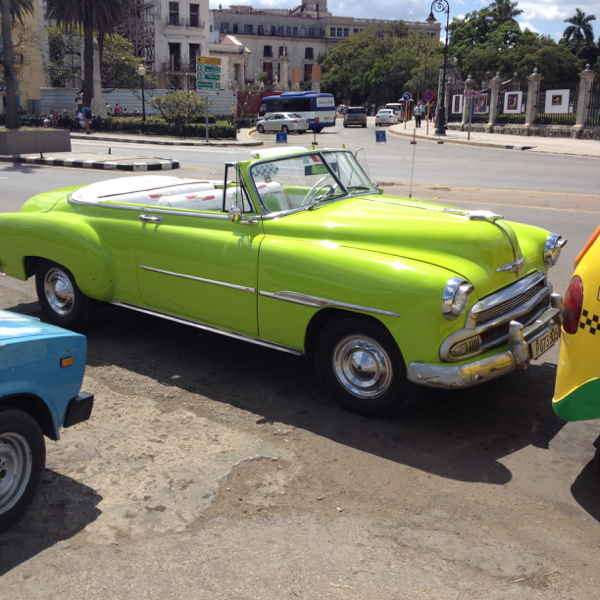 Travel arrangements including airfare, flights, lodgings and visa into Cuba from Cancun was very easy.... $350-$400 for roundtrip 2hour flight and visa. 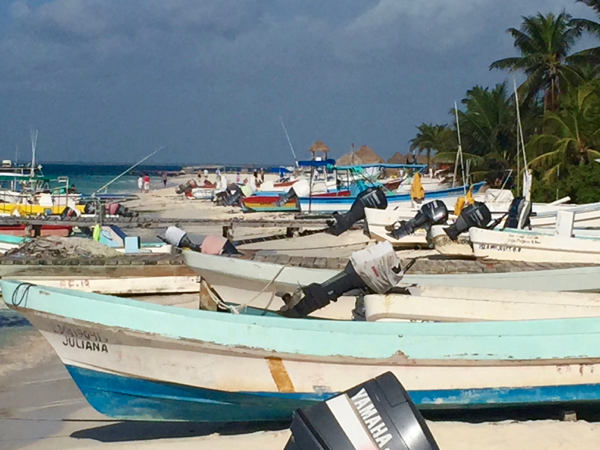 I have a good travel agent on Isla Mujeres. 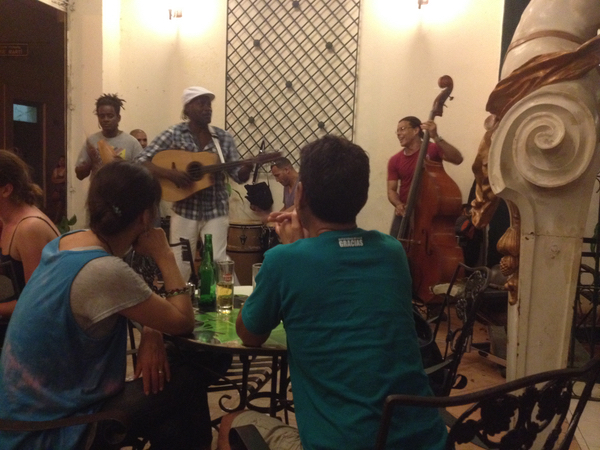 We stayed in a Casa Particular, that was in a cool, but run down part of central Havana..... a short walk to Old Historic Havana, where I would recommend someone stay, where plenty of hotels are available along with lots of restaurants and bars and music. 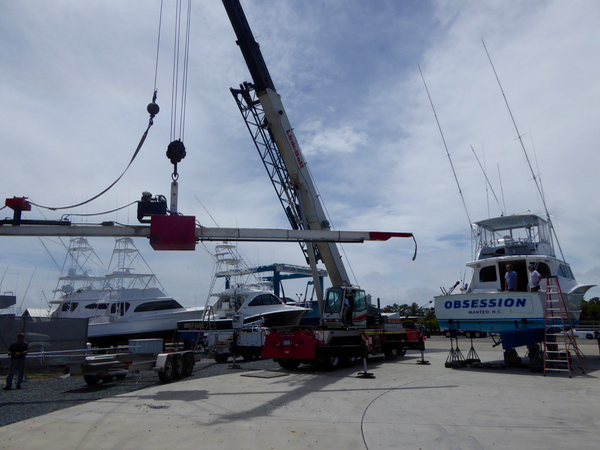 We visited Hemingway Marina, which looked like a good spot to tie up the Obsession.....it was amazing how few boats we saw on the water and the weather was beautiful.... those we saw were not much! 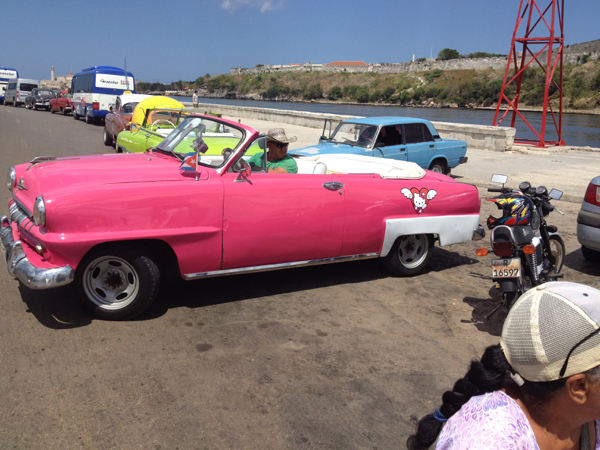 Unfortunately we had to cut the trip short to join our running partners Rom and VJ who were going to leave Mexico a day early to beat some bad weather, so we did not get to take our planned road trip thru rural Cuba..... next year! OUTDOOR TACKLE SHOP.....its a very poor country! IF HE CAN JUST GET THE DAMM THING RUNNING! 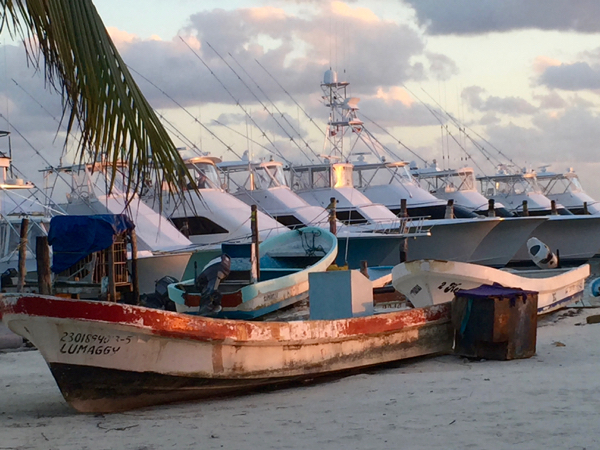 Last season the waters of Isla Mujeres had good concentrations of bait and plenty of sailfish around, most days we had good fishing within 10 -12 miles of the island... the only problem was in all the years I have fished down there, I have never seen the quantity of false albacore, aka bonitos, aka boneheads..... some days there were 5 miles of them... often we start out with good sail fishing, but around noon if not sooner, here come the boneheads, and that would shut down the sailfishing for a few hours..... we caught over 500 this season, but would have caught many more were it not for the boneheads! 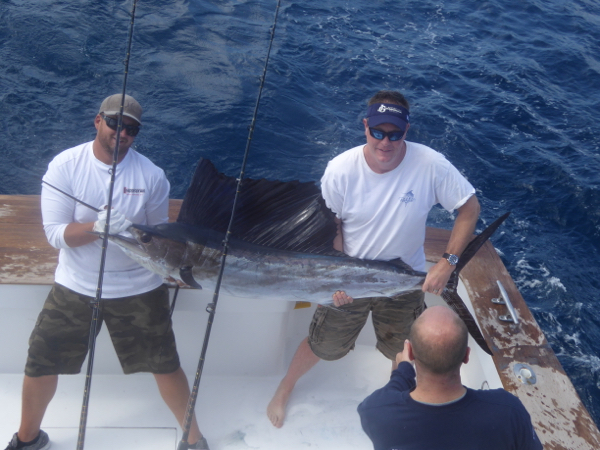 FEB 16 & 17: RUSTY GARRETT & HIS CREW CAUGHT 44 SAILFISH WITH US IN TWO DAYS, INCLUDING OUR SEASONS BEST 31 THEIR SECOND DAY! 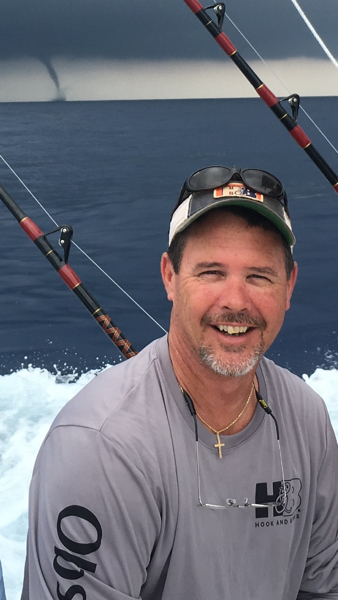 FEB 18 & 20: THOMAS NELSON WAS SECOND PLACE ANGLER IN THE ISLAND TIME FISHING TOURNAMENT, AND THE OBSESSION CAME IN FOURTH PLACE, CATCHING 19 SAILFISH IN TWO DAYS. 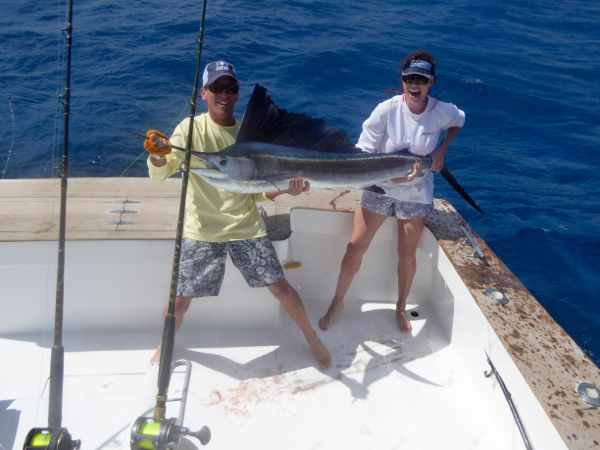 FEB 19: BRANT WISE, OWNER/CAPTAIN OF THE F/V SWORDFISH, ALONG WITH VERONICA ROWE AND MADISON AMBROSE, CAUGHT 14 SAILFISH IN HALF AN ACTION PACKED DAY.... WE HEADED IN EARLY WHEN THE BONEHEADS TOOK OVER! 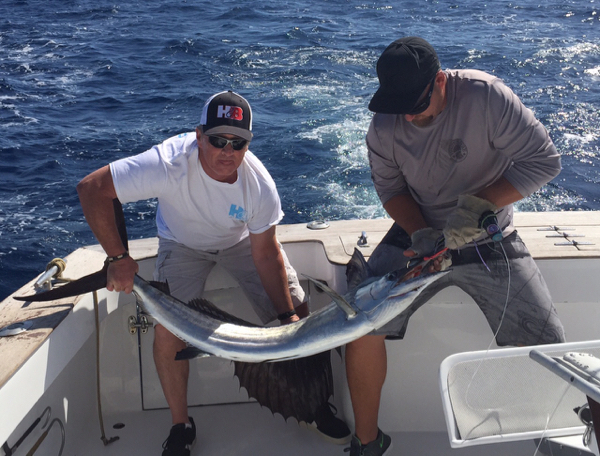 FEB 24-26: BRIAN LEWIS & CREW FROM ILLINOIS, HAD NONSTOP BONITO/BONEHEAD ACTION AND CAUGHT SOME SAILFISH AS WELL.... WE BROUGHT THE BONEHEADS IN FOR THE GUYS ON THE DOCK WHO WOULD THEN SELL THEM TO THE COMMERCIAL SHARK FISHERMAN....NOTHING GOES TO WASTE!! 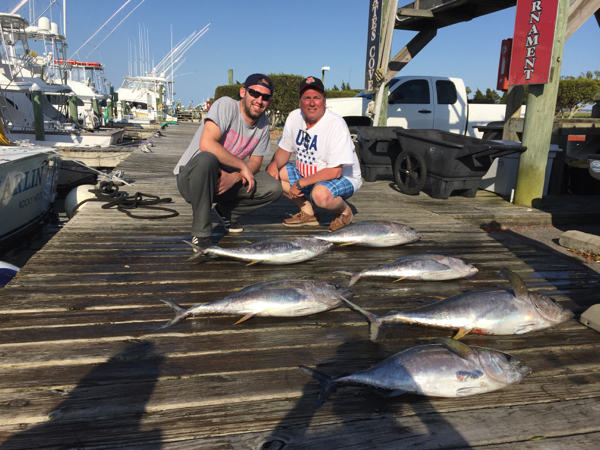 MARCH 4, 5 & 6: ROBBIE MORRIS, FROM NAGS HEAD, AND CREW FROM VIRGINIA & NORTH CAROLINA HAD GREAT LATE SEASON ACTION, RELEASING 21 SAILFISH THEIR FIRST DAY AND 45 SAILFISH IN THREE DAYS, ALONG WITH A LUNKER MANGROVE SNAPPER FOR DINNER! 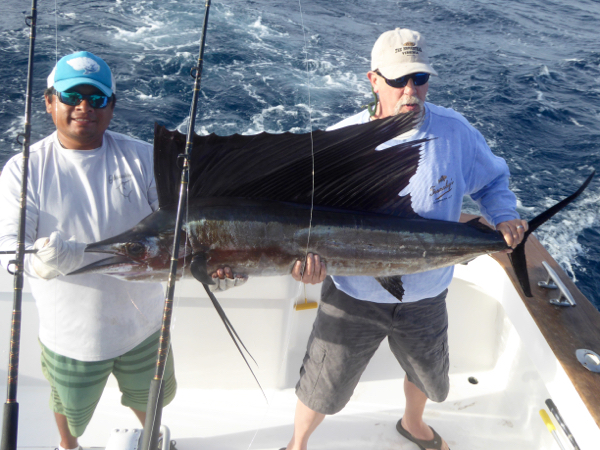 MARCH 7: VIRGIL WALKER & CREW HAD NONSTOP BONEHEAD ACTION ALONG WITH A FEW SAILFISH! 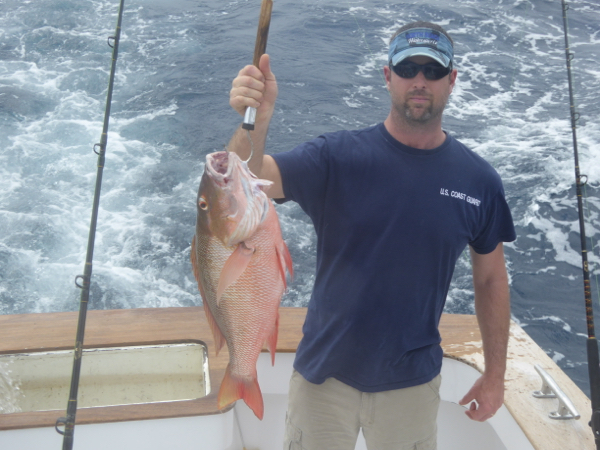 My computer crashed in early February so posting fishing reports was not possible till my wife came and loaned me hers, but even then uploading photos from my camera was not possible..... so, here are a few good ones from February and March along with a few highlights! 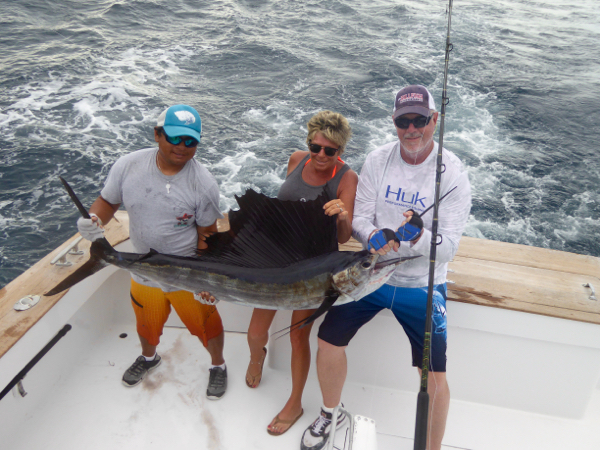 FEB 1 & 3: KIM CAMERON WITH ONE OF 50 SAILFISH BIG JOHN KNIGHT, TONY CAMERON AND KIM CAUGHT WITH US IN THREE EXCITING DAYS OF FISHING, JOHN & TONY HOOKING MOST OF THE FISH! 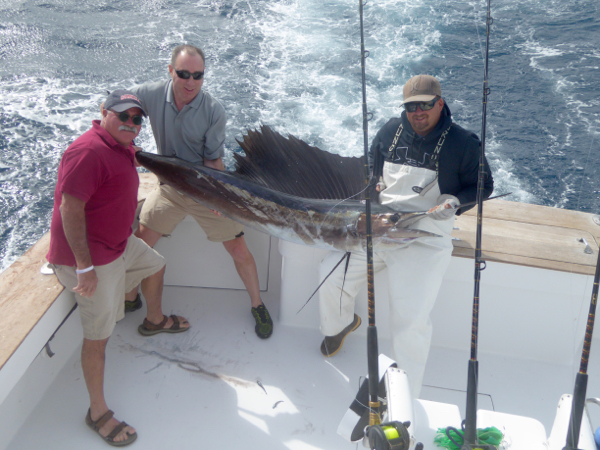 FEB 8 & 10: BRIAN MCAVOY & CREW JOHN, BILL & JAMES FROM VIRGINIA WITH A FEW OF THEIR 18 SAILFISH RELEASES. 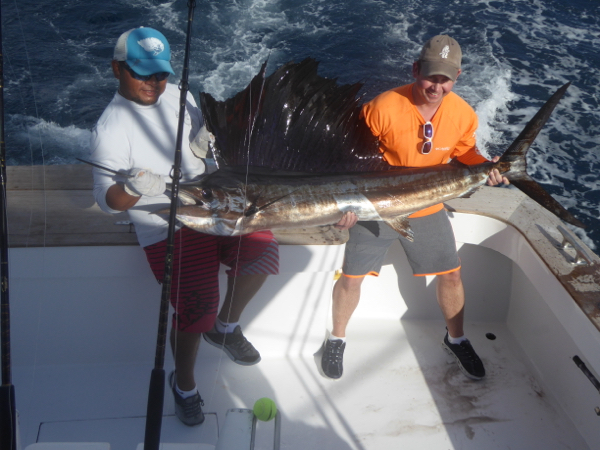 FEB 9: MARTY & JASON RELEASED 13 SAILFISH ON A ROUGH DAY, THE SEVENTH YEAR IN A ROW THEY HAVE FISHED WITH ME IN MEXICO. 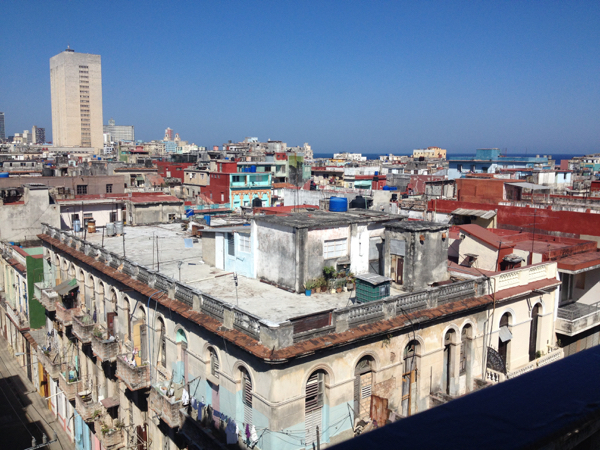 BACK FROM MEXICO/CUBA AND MY COMPUTER IS WORKING AGAIN!! Capt Rom Witicar, running the Qualifier, and Joe and I made it back from Mexico this past Monday.... great trip except for one 65 miles south of Southport NC when conditions went from calm to out of control....... 6 ft sea every 4 seconds..... took one over the bow going 7 knots.... we made a sharp left turn and eased into Geogetown Inlet at sunrise.... neither of us had ever been there, but it was well marked.... found our way to the intercostal as winds were NE 25knots, and we took the scenic route the next two days. 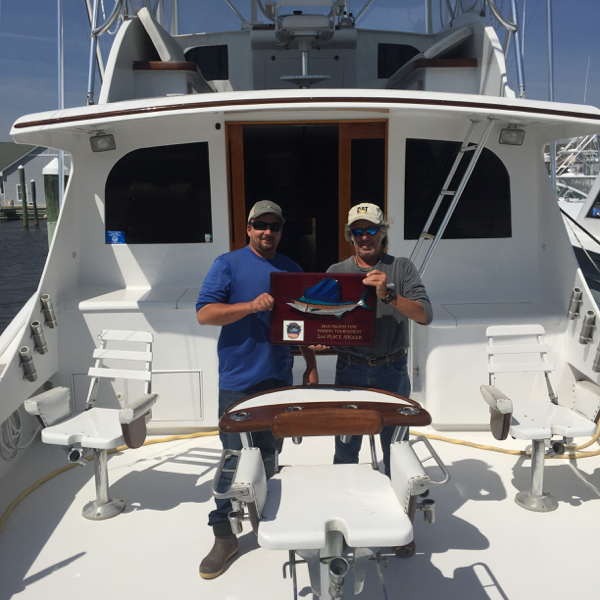 The photo of Joe and I upon return, unloading the boat, including a trophy we will be returning to Thomas Nelson, from New Jersey, for the second year in a row, winning the 2nd Place Top Angler Prize in the Island Time Fishing Tournament back in mid February...... the Obsession ended up in fourth place this year, thanks to the great angling of Thomas, along with Rick and Joanne Schall and Scott Zurawski. 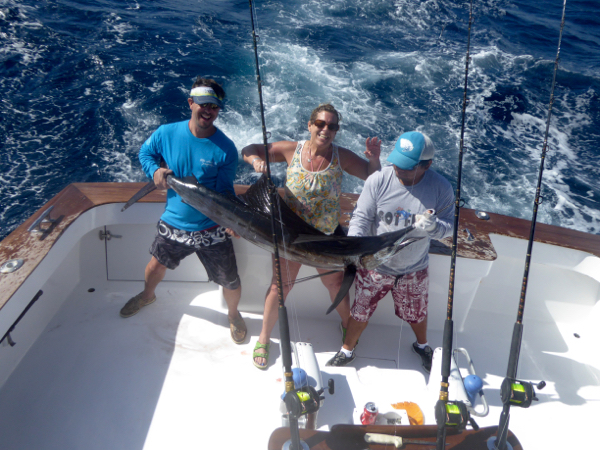 Dave Mutzabaugh & crew from Virginia fished with us our last scheduled day in Mexico for 2016.... wind was blowing 25 knots, seas 7 ft but they hung in there and released 4 sailfish and had plenty of bonitos.....man, i hope them damm things aint't so plentiful down here next year..... we released over 500 sailfish this season, which was an improvement over the last few years but well short of what we have done in the past.... we went thru over 1700 hooks.....over 1200 damm bonitos!!! 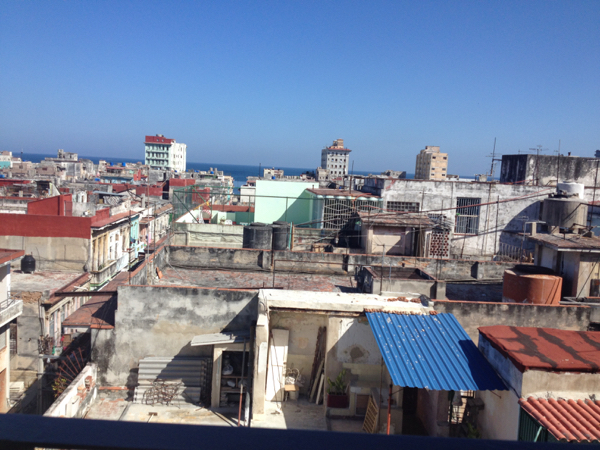 Joe and I are flying over to Havana, Cuba today.... we return on Thursday, and weather permitting, the good lord willing, will be heading back to North Carolina next weekend!d Buenos Dios! 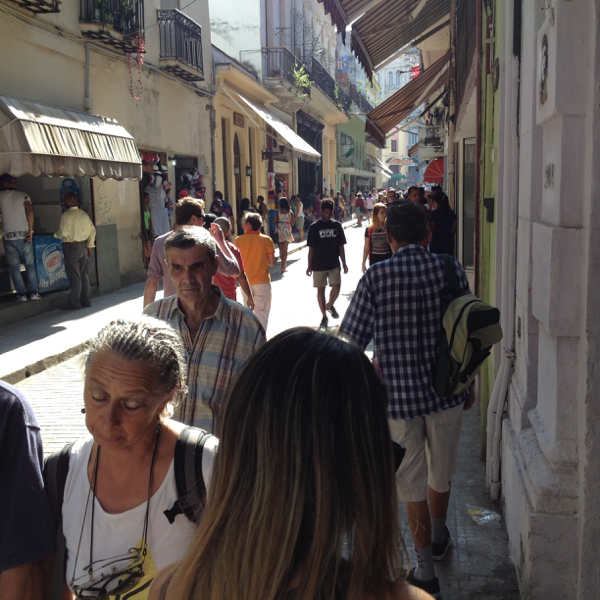 Virgil & Julie & Victoria Walker & Tom had plenty of action on Monday�. 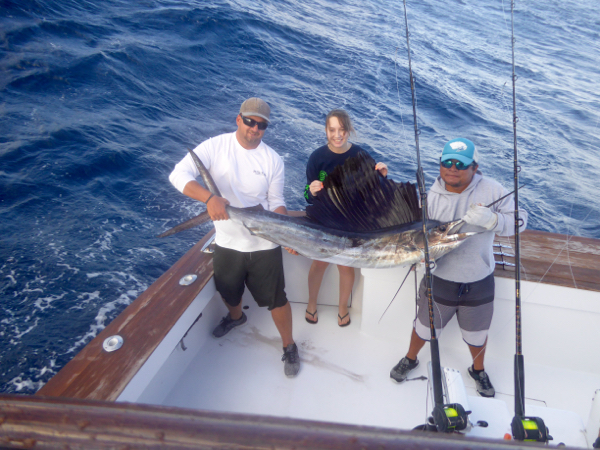 unfortunately most of it was bonitos�.. everyone did catch a sailfish. 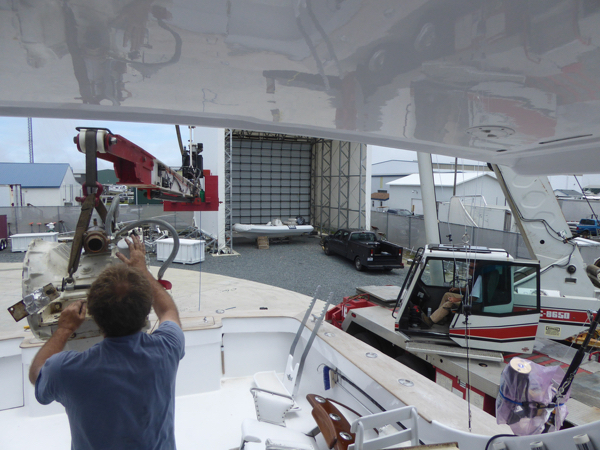 Been blowing a gale all week, but we are hoping to get their second day in Friday�. 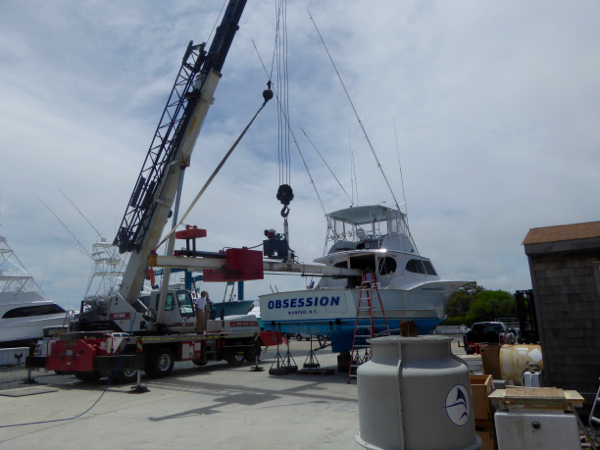 Have one more charter on Saturday, and then mate Joe & I are flying to Havana Cuba for a few days to check out things�..hopefully by next year I can get insurance and bring the Obsession to Hemingway Marina in late March & early April for some exploratory fishing. Arnold Head, Robbie Morris, Ed Michael, Whit Morris & Michael Taylor, from Richmond, Mass & NC had calm seas their first two days but their last day today we were all hanging on, but we found some good trolling action up north and the guys caught 13 out of around 20 bites, many they hooked themselves and we ended the day with a wild quadruple header, all picked off the teasers, of which we caught 3 and pulled the hook on one 20 ft from leader. 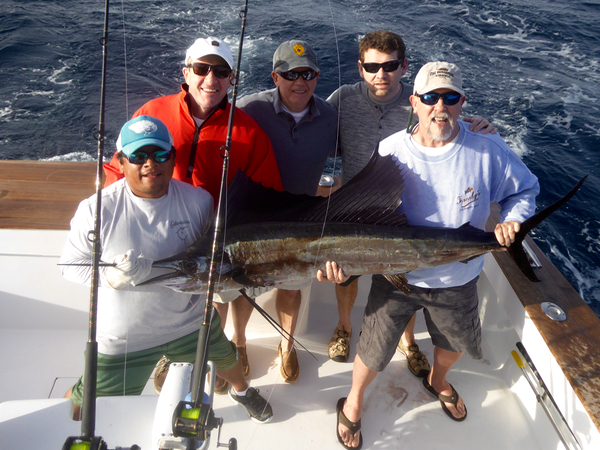 Arnold Head, Robbie Morris, Ed Michael, Whit Morris & Michael Taylor, from Richmond, Mass & NC enjoyed an unusually calm day..... sailfish were jumping everywhere in the morning, and we had good action right out of the gate, but when the fish stopped jumping our action slowed up.... the guys hooked most of their own fish today, catching 10 out of around 20 bites..... tomorrow is their last day, should be a bit breezy and hopefully the sails are hungry, but tonite the guys enjoyed a fresh mutton snapper dinner complements of Arnie who boated a 20# beauty. 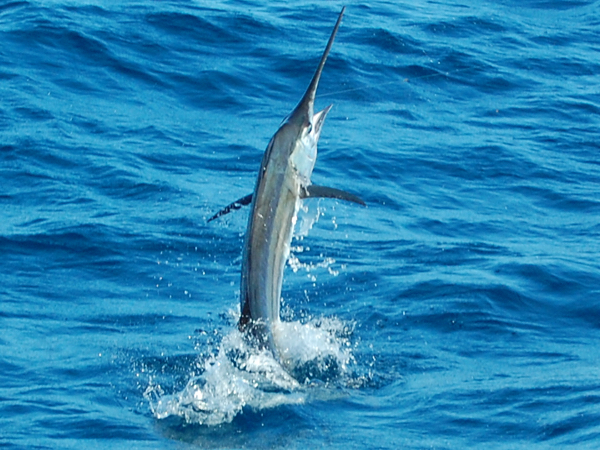 We burned a lot of fuel running 45 miles but Robbie Morris & crew had steady action all day, and the fish were crazy acting, jumping all over the place on a very pleasantly calm day....the guys released 21 sailfish, we had about 30+bites, including three triple headers, of which we only caught one triple header, along with several double headers, including one to end the day!! 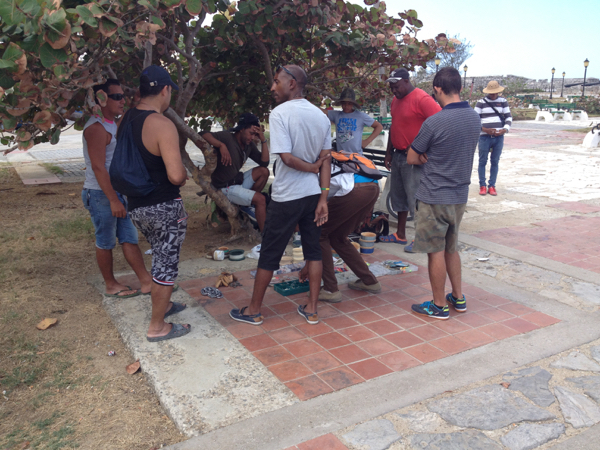 The guys will be with us again the next two days and will head north again manna!! PHOTO COMPLEMENTS OF BIG JOHN KNIGHT!